When one is younger and starting out in the world of driving, there is always bound to be a few dents and dings along the way. 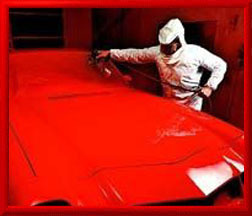 Auto bodywork is something I had to teach myself to keep my cars in shape. Like all boys growing up I was really into my cars and I was always fiddling around with them. My first car was a sports car and I would add things on like spoilers and hood scoops etc. The secret to using bondo to repair the bodywork on car is to bang the metal out to as close as possible to its old original shape with no large bumps deep pits or valleys and next thoroughly clean surfaces that are to be treated by sanding them down to the bare metal to remove all paint and primer and to create a surface that has some kind of tooth for a good bond. When you apply the bondo you want to do it in as thin a layer as you can possibly can so it cam still have some flexure properties. Then just sand it smooth . paint. and prime it and you are done.